Two California Baptist University alumni have released a children’s book about Riverside. “Hello Riverside!” was written by Mark and Giselle Cloud and illustrated by Jessica Robyn. Both Mark Cloud and Robyn are alumni. 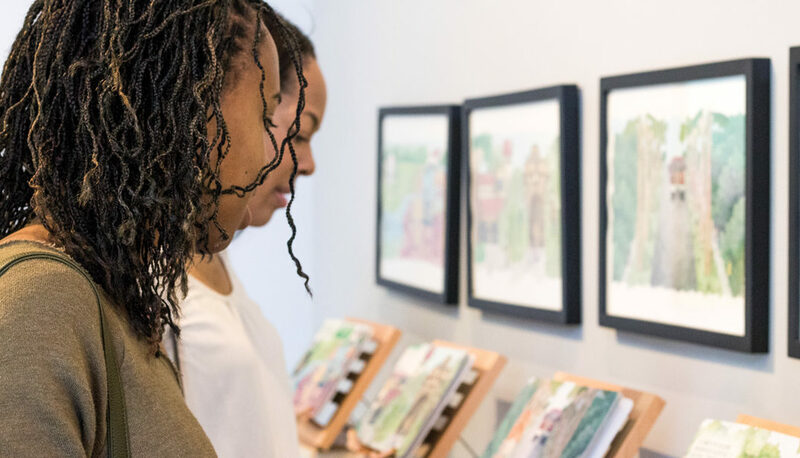 After Robyn called Kristine Lippire, assistant professor of visual art to ask her if the book could be showcased in the CBU Art Gallery, Lippire coordinated the showcase. The event was advertised through bookmarks, a digital bulletin board and press releases. “Jessica Robyn, the illustrator… is a former student of mine and she graduated in 2013. She contacted me saying ‘Hey, we just completed this children’s book on Riverside,’” Lippire said. About two years ago, the Clouds decided to create a children’s book about Riverside. The Clouds saw Robyn’s work and asked her to illustrate the book. Around the same time Robyn signed on to illustrate the book she found out she was pregnant and had her baby right after the book was finished. “Mark and GeGe go to church with me. Someone showed them my art and they called me and asked if I wanted to illustrate it,” Robyn said. Robyn’s artwork was also showcased and sold in the form of paintings and printed versions at the art gallery. She said that she has loved art ever since she was a child. The Clouds said they wanted to showcase the different neighborhoods and nationalities within Riverside, which is why the kids within the book are all different backgrounds, colors and nationalities.